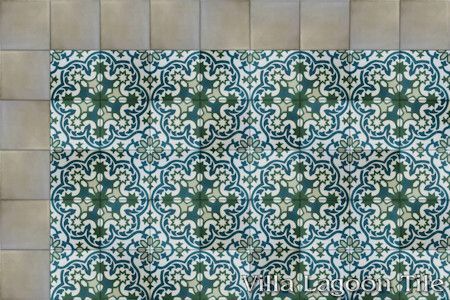 "Havana Cantina" Cement Tile On Sale! 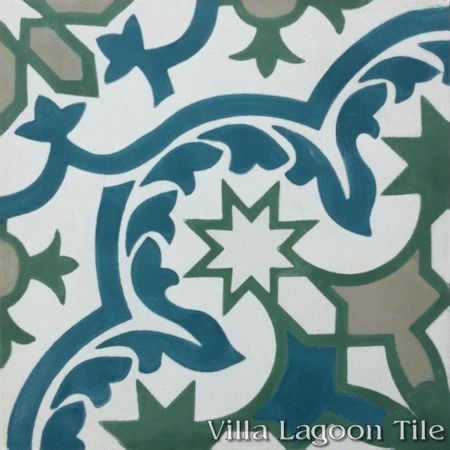 This is a 4-color 8" cement tile, using Seashell White, Dry Sage, and Custom Colors from the South Beach Palette. 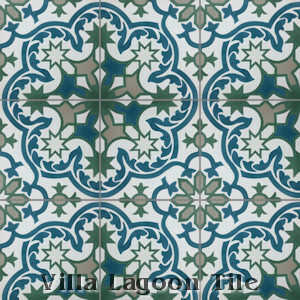 Our Havana Cantina cement tile is wonderful example of the cultural cross-overs found in cement tile. 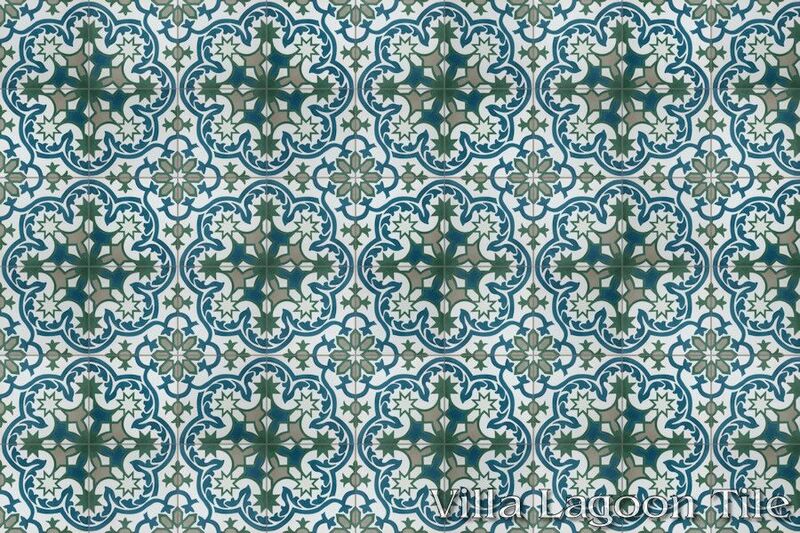 This pattern would fit equally well in collections of Cuban tile patterns and Moroccan tile patterns. 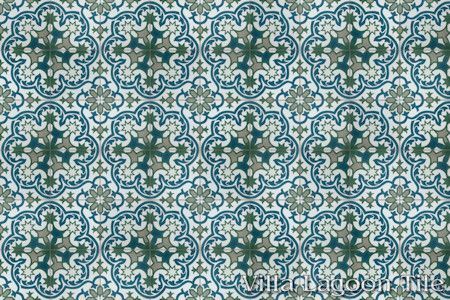 We find in this pattern a beautiful balance between the repeating geometry of the eight-pointed stars, and the flowing organic elements creating a larger floral pattern around them. Havana Cantina, Lot SB-D06, In Stock Sale! Standard Price:$7.29 per tile ($16.76 / square foot)12 tiles per box. Our Current Production: "Havana Cantina", SB lots. 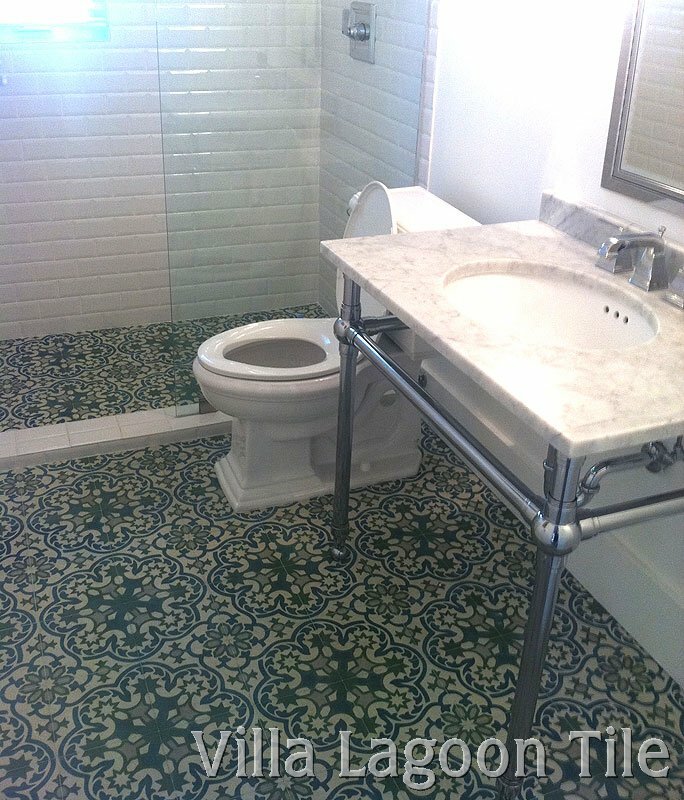 Our previous production was a 4-color 8" cement tile, using Ivory, Laguna, Fir, and Khaki from the Marrakesh Palette. 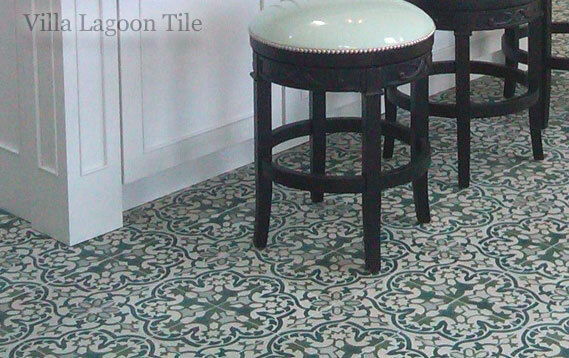 Our Marrakesh tile studio is great for European orders, with a minimum order of 500 square feet. 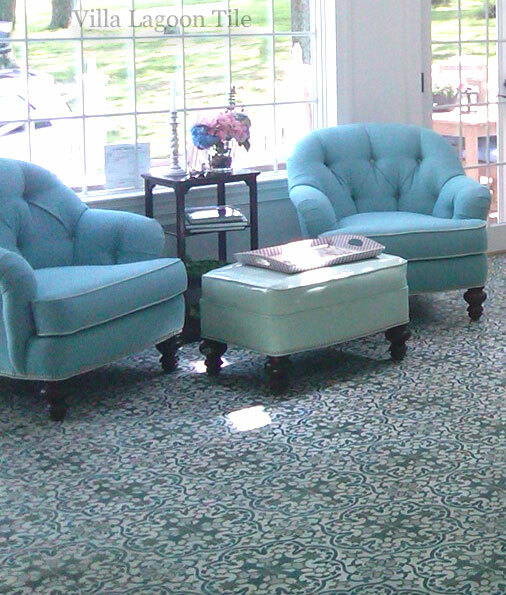 See this entire room in our image gallery. 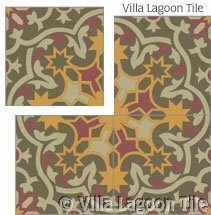 This fantastic interlocking design is reminiscent of elaborate antique Cuban tile floors. The presence of the stars in the design gives it a bit of a Moorish look as well. 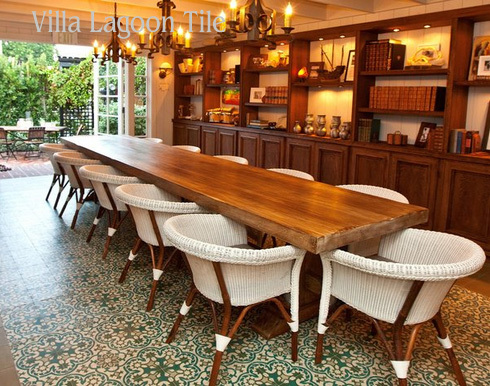 The restaurant/bar above has a large expanse of Havana Cantina made by our European tile maker. These colors vary a bit. 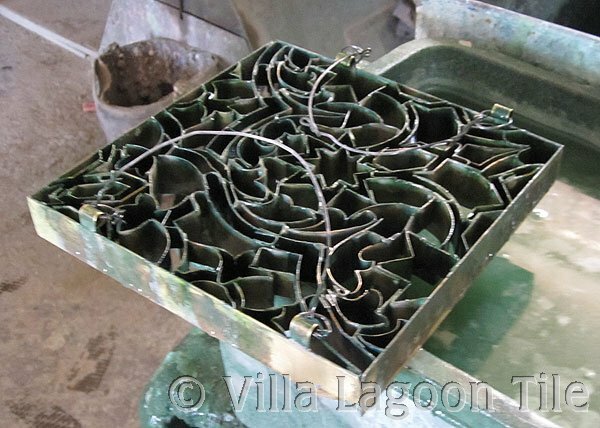 Look at the intricate mold pattern that is used to make this tile. A craftsman pours the colored liquid cement into each compartment to create the pattern you see above. 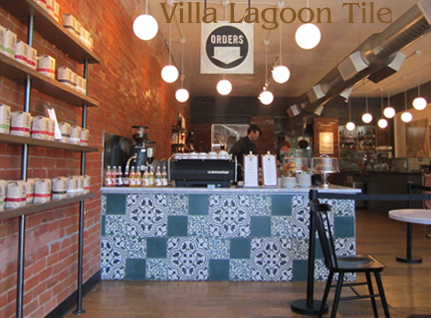 This fun installation at Boulder, Colorado's Boxcar Coffee Roasters features three different tiles. 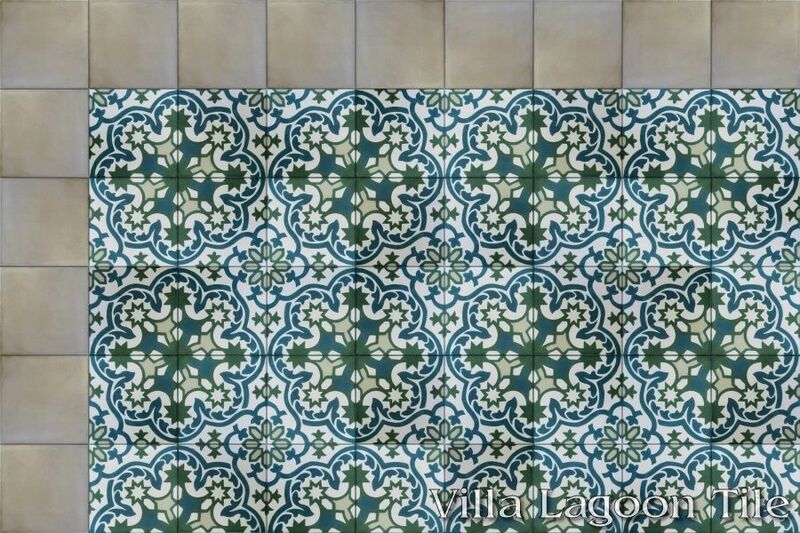 Our Havana Cantina, solid Laguna (a Villa Lagoon Tile exclusive color), and a custom black and white colorway of the Roseton pattern (also called Bayahibe). See this same pattern in completely different colors.